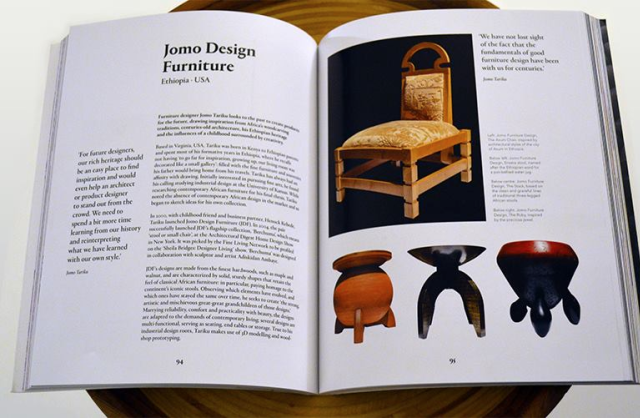 New York (TADIAS) — The newly released book, Contemporary Design Africa, includes a highlight of exquisite Ethiopia-inspired furniture designs and Berchuma collection by U.S.-based Ethiopian designer Jomo Tariku. The book, the first of its kind, features fifty artists from Africa and the Diaspora “all of whom are creating sophisticated and innovative products for interiors,” says the publisher Thames & Hudson. Jomo’s products celebrate the traditional aesthetic of Ethiopian household items with modern design and artistic sensibilities. He told Tadias his designs are available for licensing and could be manufactured for any potential large orders and “the furniture pieces will look great inside one of the many lodges and hotels found all over Africa as well as any residences that want to have unique spaces.” Jomo currently works on graphic design at The World Bank Group in Washington, D.C. The author of Contemporary Design Africa, Tapiwa Matsinde, is a British-born designer, creative business consultant, blogger and writer of Zimbabwean heritage. She has worked as a graphic designer and a brand guardian in corporate communications for leading international organizations. The publisher notes that “Moreover, Contemporary Design Africa presents talent from lesser-known countries including Mauritania, Guinea and the DRC alongside countries – Nigeria, Morocco and South Africa – already making a definite mark on the global design industry.” In addition to Jomo, the Ethiopian textile company Saba Har (www.sabahar.com) is also showcased in the book under the fabrics section. You can learn more about Jomo Design at Jomofurniture.com. And purchase the book at Amazon.com.